Come and join me throughout 2019 for natural dye workshops I’ll be teaching in the beautiful, quaint town of Sperryville, VA, at Wild Roots Apothecary—a darling destination shop and studio in the foothills of the Blue Ridge Mountains. Please contact me if you have any specific questions. Be sure to enter your name and email address below if you would like to be added to the Saint Virginia mailing list for advance notice of workshops. Register for classes online at Wild Roots Apothecary. This is a relaxing, experiential dye class where you’ll learn the bundle-dye technique using springtime dyestuffs to create beautiful colors and prints on fabric. 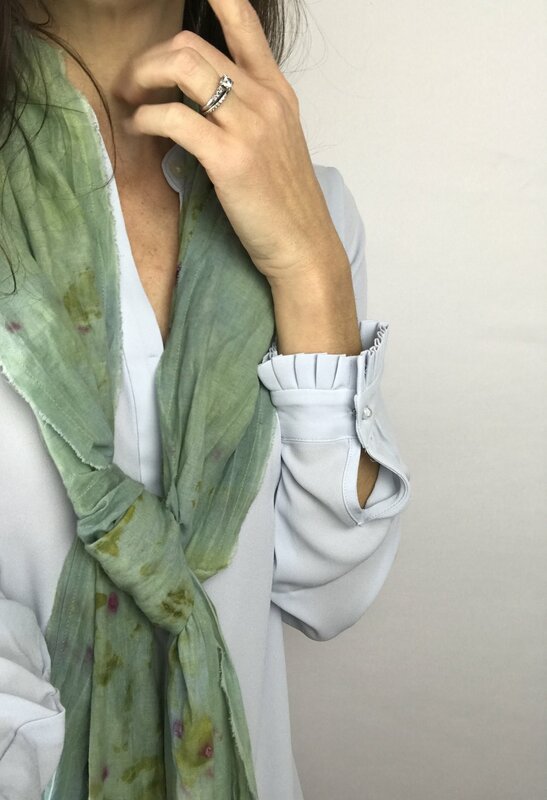 You’ll dye an organic cotton scarf with natural colors, creating the perfect scarf for the perfect scarf season. We’ll enjoy drinks and brunch nibbles, and you’ll take home your lovely hand-dyed scarf, plus knowledge and resources for more dyeing at home. Sign up here. This is a beautiful, relaxing, experiential dye class where you’ll learn the bundle-dye technique using flowers to create seasonal colors and prints on fabric. You’ll dye an organic cotton bandana scarf with flowers you can grow in your garden, creating a bespoke, summertime accessory. We’ll enjoy drinks and nibbles, and you’ll take home your special hand-dyed bandana scarf, plus knowledge and resources for more dyeing at home. Sign up here.